Thomas: "What do you mean, 'WAIT'? Is it, or is it not, go-time?" 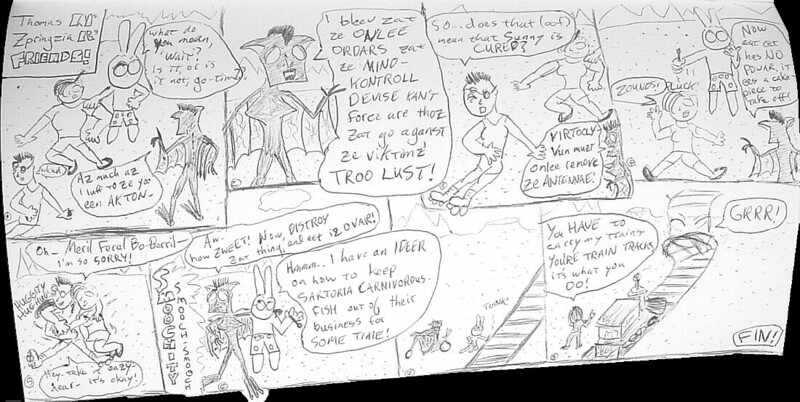 Zpringzia: "Az much az I luff to zee yoo een AKTON..."
Zpringzia: "I bleev zat ze ONLEE ORDARS zat ze MIND-KONTROLL DEVISE KAN'T force are thoz zat go aganst ze viktimz' TROO LUST!" Meril: "So..does that (oof) mean that Sunny is CURED?" Zpringzia: "VIRTOOLY--Vun muzt onlee remove ze ANTENNAE!" Zpringzia: "Now zat eet has NO POWAR, it ees a cake-piece to take off!" Sunny: "Oh--Meril Feral Bo-Berril--I'm so SORRY!" Meril: "Hey--take it eazy, dear--it's okay!" Zpringzia: "Aw--how ZWEET! Now, DISTROY zat thing, and eet iz OVAR!" Thomas: "Hmmm..I have an IDEER on how to keep SARTORIA CARNIVOROUS-FISH out of their business for SOME TIME!" Sartoria: "You HAVE to carry my trains--YOU'RE TRAIN TRACKS, it's what you DO!"